Monarch Air Group provides private air charter in Modesto, CA. Our clients benefit from top-notch service, unrelenting dedication to safety, wide selection of aircraft, and years of experience in chartering private jets. To obtain a free quote, please use our online quoting tool provided below, or call toll free 1-877-281-3051. Monarch Air Group provides private jet charter flights in and out of Modesto, California, USA. Modesto is a city in north central California, in the San Joaquin Valley. 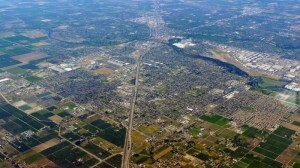 With a population of about 201,165 people, Modesto is the 18th largest city in its state. The city is a home to numerous tourist attractions including Gallo Center for the Arts, McHenry Mansion, John Thurman Field, Aquatic Dreams Scuba Center, Modesto Arch, Stanislaus River Rafting, Affordable Massage Studio, and some others. Modesto is served by Modesto City-County Airport (MOD / KMOD), which is located 3 miles from the city center, Stockton Metropolitan Airport (SCK / KSCK), which is located 25 miles from the city, and Merced Regional Airport (MCE / KMCE), which is situated 40 miles from Modesto. 1. CCR, Buchanan Fld, Concord, United States. 2. COA, Columbia, Columbia, United States. 3. HLI, Hollister, Hollister, United States. 4. HWD, Air Terminal, Hayward, United States. 5. JBS, Hacienda Bus.Park H/P, Pleasanton, United States. 6. LSN, Los Banos, Los Banos, United States. 7. LVK, Livermore, Livermore, United States. 8. MAE, Madera, Madera, United States. 9. MCE, Merced Municipal Arpt, Merced, United States. 10. MER, Castle AFB, Atwater, CA, United States. 11. MHR, Sacramento Mather Airport, Sacramento, CA, United States. 12. MOD, Municipal, Modesto, CA, United States. 13. NRC, Aux Field, Crows Landing, United States. 14. NUQ, Moffett Field, Mountain View, United States. 15. OAK, Oakland International Airport, Oakland, United States. 16. PAO, Palo Alto, Palo Alto, United States. 17. RHV, Reid-hillview, San Jose, United States. 18. SAC, Executive, Sacramento, United States. 19. SCK, Stockton Metropolitan Airport, Stockton, United States. 20. SJC, Mineta San Jose International Airport, San Jose, United States. 1. Days Inn Modesto Hotel, 1312 McHenry Avenue, Modesto. 2. Courtyard by Marriott Hotel, 1720 Sisk Road, Modesto. 3. Courtyard Modesto, 1720 Sisk Road, Modesto. 4. DoubleTree by Hilton Modesto, 1150 Ninth Street, Modesto. 5. Days Inn Modesto Hotel, 1312 McHenry Avenue, Modesto. 6. Clarion Inn Conference Center, 1612 Sisk Road, Modesto. 7. Courtyard by Marriott Hotel, 1720 Sisk Road, Modesto. 8. Courtyard Modesto, 1720 Sisk Road, Modesto. 9. DoubleTree by Hilton Modesto, 1150 Ninth Street, Modesto. 10. DoubleTree by Hilton Modesto, 1150 Ninth Street, Modesto.